What is the abbreviation of Virginia? What is the abbreviation of Alabama? What is the abbreviation of Ohio? What is the abbreviation of Alaska? 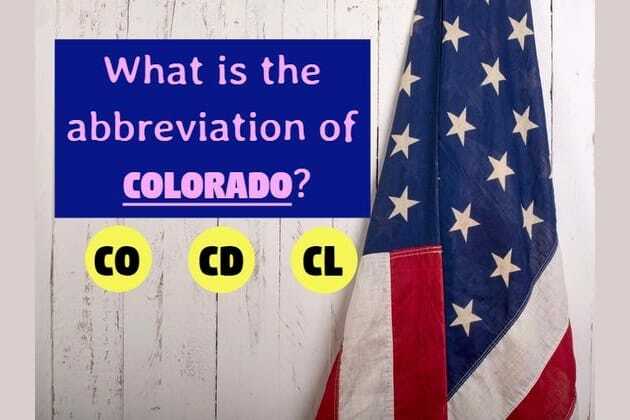 What is the abbreviation of Colorado? What is the abbreviation of North Carolina? What is the abbreviation of Oregon? What is the abbreviation of Nevada? What is the abbreviation of Nebraska? What is the abbreviation of Wyoming? What is the abbreviation of Montana? What is the abbreviation of Arkansas? What is the abbreviation of Delaware? What is the abbreviation of Missouri? What is the abbreviation of Rhode Island? What is the abbreviation of Hawaii? What is the abbreviation of Georgia? What is the abbreviation of Utah? What is the abbreviation of Wisconsin? What is the abbreviation of Idaho? What is the abbreviation of Tennessee? What is the abbreviation of Arizona? And last, what is the abbreviation of Oklahoma? Perfect score!! You are a proud American patriot. Share the quiz with everyone you know. Happy Forth!! Are you an American genius? Can you get at least 23/24?